CCTV (closed-circuit television) is set up with a remote camera or multiple cameras that are linked wirelessly or by cable to a monitor which might be your computer monitor or your television. There are two potential objectives when installing CCTV at home. Do you want to be able to view what’s happening around the outside of your residence? Or are you more concerned with the safety of children, household members, or pets indoors? CCTV is not always intended to produce digital or tape recordings of camera views. Decide whether you personally plan to monitor CCTV in real time or prefer to go about your business while your equipment records images you can refer to later as necessary. Before making your choice, consult with a homeowner who has installed CCTV. If an incident occurs at an undetermined point in time, watching even time-lapsed recordings of nothing for hours in order to spot the culprit in action is a task most people find frustrating and loathsome. Some camera owners thoughtlessly assume the police have sufficient time and staff to review video recordings for evidence of even the most insignificant offences. If you plan to use a surveillance camera to gather evidence, you must first learn how to locate, retrieve, and copy the relevant recorded images. The importance of purchasing a CCTV system that is easy for you to operate cannot be overemphasized. Parents who feel insecure about leaving their children with caregivers sometimes install “nanny cams.” If you want to use CCTV for the purpose of observing household employees, refer to “Investigating Employee Misconduct” for information on compliance with the law. Interior CCTV can also enable homeowners to quickly check on the welfare of small children, elderly housemates, or pets. Surveillance cameras inside your home are somewhat easier to conceal and protect from tampering and are not exposed to the weather. Images recorded indoors can be superior in quality, because confined spaces limit the subject’s distance from the camera. Interior cameras can be installed and focused to capture views from the best possible angles. CCTV with a view of your home’s curtilage can help you keep an eye on nuisance neighbours, prowlers, and potential criminals. It can allow you to see who’s knocking at your door or tampering with your mailbox. There are drawbacks. A burglar can easily disable a camera visible on the outside of your home. A determined criminal can simply choose a point of entry outside the camera’s range. As for those annoying neighbours, facing a camera could incite them to become violent or at least to redouble their efforts to make your life miserable. They might accuse you of antisocial behaviour for invading their privacy with your CCTV. In order to obtain video recordings of sufficient quality to permit you or the police to identify anyone pictured in them, you’ll need to purchase a high quality camera system. Don’t forget that you won’t be able to see or record anything at night unless your surveillance camera is capable of infrared photography or the area within view of the camera is extremely well lighted. 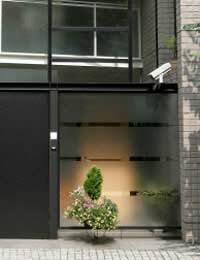 If you’re technologically adept, you might want to select a CCTV system compatible with your computer for ease of use. There are many inexpensive surveillance cameras. If you’re tempted to purchase one, you should know that even some banks’ surveillance schemes are inadequate when it comes to capturing useful evidence. A poor video image of a criminal may at best reveal that a human being was present at the time and place an offence allegedly occurred. If the recorded images don’t clearly show the offender’s hands and face, then it’s unlikely anyone will be able to tell from the recording whether the crime was committed by a man, woman, or child. What value is a wanted poster so blurred that the offender sought could be virtually anyone? CCTV should never be thought of as the most important or only necessary security measure for your home and family. More reliable for deterring criminal intrusions are strong locks, good exterior lighting, landscaping that doesn’t provide concealment, nosey neighbours, and your personal vigilance. If you leave your house keys dangling in the outside of your door or postpone repairing that faulty window latch, then you’ve made your home an easy target for intrusion. That path of least resistance is what criminals avidly seek.